In this Watercolor & Acrylic Painting Class I will cover the basics of painting, color mixing, and composition techniques. Participants will learn how to use these techniques to create landscapes, portraits, and abstract paintings. Cory Brown, Gabrielle Graber, Lea Griggs, Yeh Rim Lee, Will Newman-Wise, Ryan Rennie, Alex Zablocki, Kelsey Zwarka, Soojin Choi, Grant Landreth, Wanying Liang, Cory Mahoney, Liisa Nelson, Nora Arrieta, Brooke Cashion, Ruth Easterbrook, Andrés Monzón, Chase Travaille, Nick Weddell, Jinsik Yoo. Opening reception: Friday, March 16t h, 5:00 - 9:00 p.m.
Exhibition dates: Tuesday March 13t h through Saturday the 17t h.
The College of Ceramics is a statutory college at Alfred University. Created by an act in New York State legislature in 1900, the college was established to support the state’s growing ceramic industry. Today, the college continues to benefit the state through its educational, research, and community outreach activities. The Ceramic Art M.F.A. program is ranked by U.S. News and World Report as the number one of its kind in the Nation. 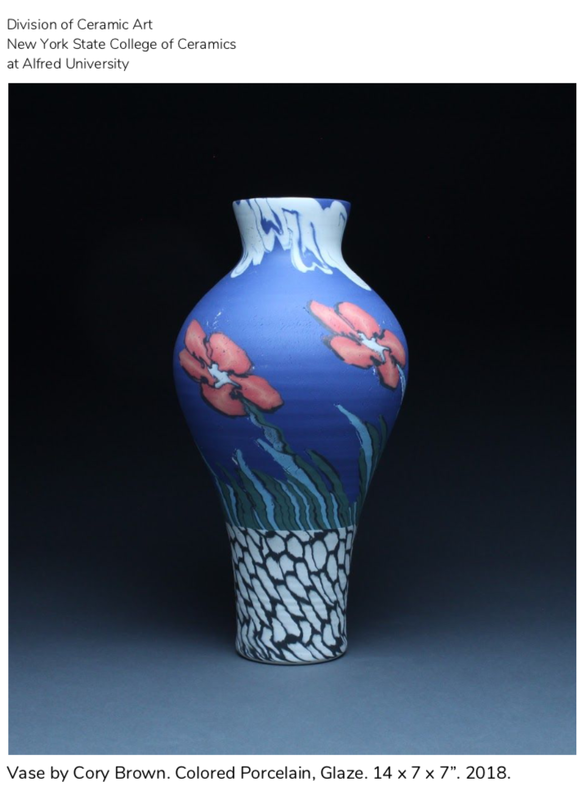 The National Council on Education for the Ceramic Arts (NCECA) is a dynamic organization that engages and sustains a community for ceramic art, teaching and learning. In addition to deepening knowledge within the field, NCECA expands it by working to cultivate the next generation of ceramic artists and enthusiasts through programing that affects professional artists, K-12 schools, community centers, universities, museums, galleries, businesses, organizations, collectors and enthusiasts of ceramic art. Currently comprised of approximately 4,000 members from the United States and more than 20 foreign countries, NCECA reaches thousands of additional individuals each year through its programs, publications, events, exhibitions and resources. The focus of this class is for students to create compelling sculptural objects inspired by their everyday interactions. Students will bring a variety of references to use as inspiration that will then intern inform their sculpture. This workshop provides the basics of working with armatures, modeling, carving, pinching, coiling, and solid building. Using the plasticity that clay provides, students will refine the skills that best suits their personal style of form development. This exhibition by Gabrielle Grace Graber will include figurative studies in ceramics and painting, and an installation with life-size figurative sculptures next to inkjet printed photographs on silk organza fabric.